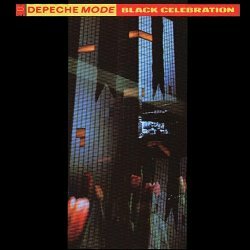 Black Celebration (1986) Arguably Depeche Mode's largest transformation came in 1986, with the release of their fifteenth single "Stripped", and its accompanying album Black Celebration. Jettisoning much of the "industrial-pop" sound that had characterised their previous two LPs (although they retained their often imaginative sampling), the band introduced an ominous, highly atmospheric and textured sound, accompanied by some darker, bleaker, lyrics, as written by Gore. Also included on the album was a revised version of the song "Fly on the Windscreen", which had originally appeared as the b-side to "It's Called a Heart". The band recognised the song's promise, and decided to improve it and include it on the album, renamed as "Fly on the Windscreen - Final". This song was also featured on an episode of the US television series "Miami Vice". As a testament to the album´s success, in later world tours, several songs from Black Celebration have appeared in tour setlists. The music video for "A Question of Time" was the first to be directed by Anton Corbijn, beginning a working relationship that continues to the present day. Corbijn has directed 19 more of the band's videos (the latest being 2006's "Suffer Well") and live performances, and has been responsible for some of the band's album and single covers. "But Not Tonight", the B-side to "Stripped" was released in October as the third single for the US. It did not chart.